(Updated 2019) The National Merit Scholarship Program seems like a great opportunity for test savvy high school students and their families to make a substantial dent in college costs. Well, it really all depends. Much to the surprise of many families, being a National Merit Finalist doesn’t mean a full-ride scholarship to the college of your choice. There are three types of National Merit Scholarships. There is the one-time $2,500 awarded by the National Merit Scholarship Corporation to approximately 7,600 scholars. Corporations sponsor another 1,000 scholarships, mainly for children of employees but also for students living in certain areas or pursuing specific majors. These may or may not be renewable and range in value from $500 to $10,000. The problem is that these schools are generally not the same schools everyone wants to attend. In fact, very few of the most competitive colleges and universities sponsor National Merit Scholarships. That doesn’t mean these schools don’t have National Merit Scholars. In 2017, Stanford enrolled 168, Harvard 219, and Yale 156. None of these students received National Merit Scholarships to attend these schools. These schools just don’t have offer money as an incentive to attend. And for those competitive colleges that do such as the University of Chicago, Carleton College, and Vanderbilt University, the amounts tend to be small relative to the actual cost of attendance. If you want to get the most out of being a National Merit Scholar, target a 50-50 school. Out of over 180 schools sponsoring National Merit Scholarships, 107 of them are 50-50 schools. This isn’t surprising since many of these colleges are interested in developing a national reputation. Colleges haven’t been shy about publicizing the number of National Merit Scholars attending their institutions. They are also more likely to provide scholarships that significantly reduce tuition costs while being renewable. Some colleges include yearly stipends or funds for study abroad programs. The University of Oklahoma waives 100% of tuition for out-of-state National Merit Scholars for five years. Students can also use the waiver toward any graduate or professional program if any funds remain after completing their undergraduate degrees. If you’re willing to attend a less prestigious college, being a National Merit Scholar could result in an actual “free ride” to college. 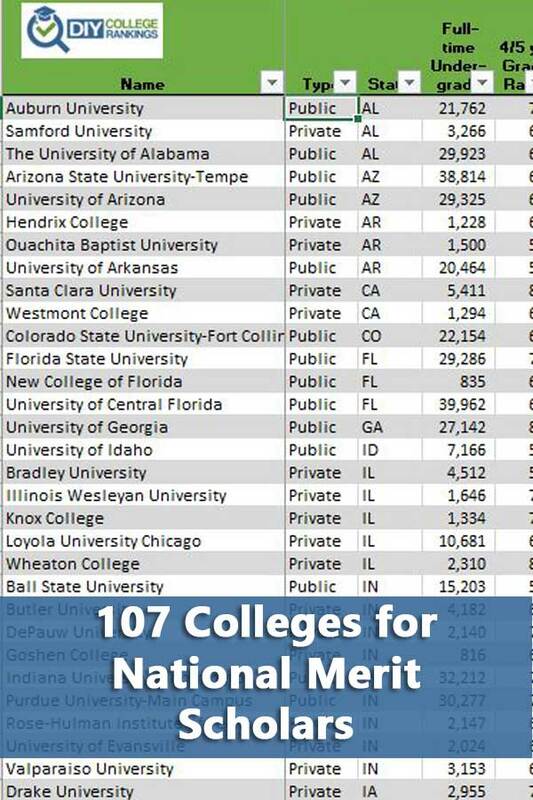 The table below lists 50-50 colleges for National Merit Scholars. All expect to sponsor National Merit Scholarships this past year. As usual, the four-year graduation rate is used for private colleges and the five-year rate for public.